Home travel ISTANBUL HERE WE COME! We flew from London Gatwick Airport to Istanbul Ataturk Airport. At that time, we only flew one-way because our next destination is Dubai, not back to the UK. huhu so the round flight ticket should be around £90 or probably you could get cheaper if you 're luckier than me. hoho We chose our place for stay from AirBnB. However, the one that we chose seems not very good, so I would not recommend it here. However, in Istanbul, hostels are rather cheap. You can get one night as cheap as £15. The currency is Lira and they speak Turkish and little or very little English. So, our first visit is Blue Mosque. It is rather magical or feel like magical because right on time when we reached in front of Blue Mosque (SultanAhmet Mosque), it was time for Azan (calling for Muslim prayer time). Istanbul city is rather small. You can walk from one attraction to another. One good thing about our apartment is it is situated near the Blue Mosque, and Blue Mosque is near to Aya Sofia, Topkapi Palace, Grand Bazaar. We were able to perform our prayer in the mosque alhamdulillah. However, please be aware that there can be scammers around the mosque. We encountered two scammers, one a lady with a baby and one small kid. So, just be aware and keep your wallets and belongings safe. 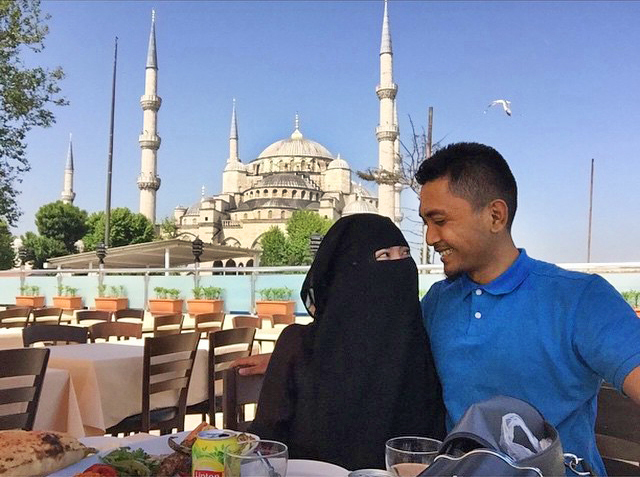 One tip - You can go to have or dinner on top of restaurant roof and get a spectacular picture of Blue Mosque with better view. This one is on top of Tamara Restaurant. I could say it was worth the foods and views. The food prices are rather reasonable and affordable. After Blue Mosque, we went off to Aya Sofia that situated just in front of Blue Mosque. However, to enter into Aya Sofia there is an entrance fee of 30 liras. Same goes with Topkapi Palace. However, it will worth to enter Topkapi Palace because you can get to see many historic stuffs like such as cloak of the prophet Muhammad, his sword, one tooth, a hair of his beard, his battle sabres, an autographed letter and other relics that are known as the Sacred Trusts. Then, we went to Grand Bazaar. It is a shopping paradise. huhuhu. However, it is better if you have known or have a local friend that can be your tour guide, especially in Grand Bazaar since they are likely to give you the 'tourist' price if you know what I mean. We are so lucky to have met one very good gentleman from the airport name Bilal, and two young ladies Damara and Zaliha from instagram that brought us to many places to eat and sightseeing, as well as Bosphorus ferry ride which is 15 liras only where you can see the Asian part of Turkey. You can also shop many things such as spices or the famous Turkish delights here. The other thing that is very nice about Istanbul is the fooddddd!!! It is cheap and in big portion. So we went and tried a lot of Turkish foods. From their teas to kebabs, desserts, and rice. Even though Blue Mosque and Aya Sofia are two famous mosques, actually there are so many mosques in Istanbul. Like literally everywhere. We managed to go to perform prayers in several different mosques such as Sulleyman Mosque. There are so many historic things that I could share here about Istanbul, however I would love to make my entry short. So when I have much more time, I will cover only the history story about Istanbul. Final thing, checked which airport your flying out because Sabiha Airport and Ataturk Airport are definitely not near, and no fun going to wrong airport by mistake like us hahaha.